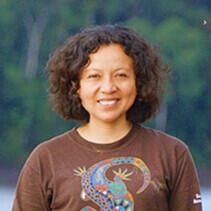 Dr. Roxana Arauco Aliaga serves San Diego Zoo Global as Research Coordinator and Manager of Cocha Cashu Biological Station. She participates in all scientific events and programs of the station, and is a key organizer and implementer of our annual Tropical Ecology and Field Techniques Course. As station manager, she works to ensure that staff, researchers, students, and visitors to this remote location have everything they need to carry out their research and have a successful stay. Roxana is a Peruvian biologist interested in evolutionary, community, population, and behavioral ecology, with a special focus on tropical ecosystems and collective behavior. Much of Roxana’s scientific work has been focused in southeast Peru, including Tambopata, Bahuaja Sonene, Madre de Dios river, Los Amigos, and Manu. Her passion for Amazonian rainforests began when she spent seven months as the resident naturalist at the Explorer’s Inn in Tambopata. From there, she worked as a guide, field assistant, monitoring biologist, BBC film location scout, graduate student, and biological station field manager. Roxana’s more than ten years of experience relevant to tropical forests and conservation – including tourism, research, large-scale monitoring programs, and education – have shaped her vision about the complexities of the economic and social context of Amazonian rainforests. Roxana earned her bachelor’s degree from the National University Federico Villarreal in Lima and her doctorate in Ecology and Evolution from the University of Utah. She was a postdoctoral scholar at Stanford University. She has now returned to Cocha Cashu to continue her efforts to support science, education, and conservation.